Ditch delivery and make your own yummy Pepperoni Pizza Sliders right at home. 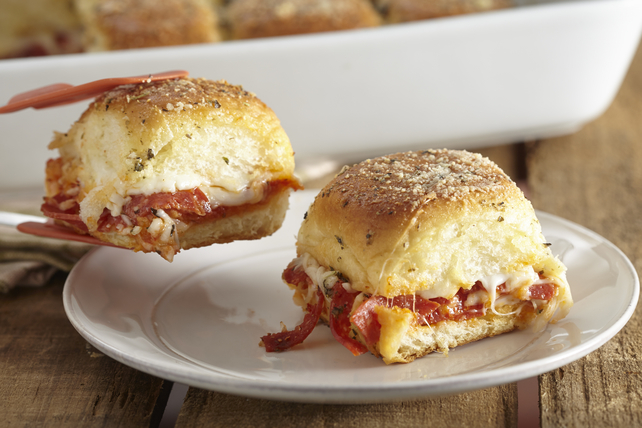 You need just 15 minutes of prep time to enjoy these Pepperoni Pizza Sliders. Cut buns horizontally in half; place bottom halves of buns in 13x9-inch baking dish sprayed with cooking spray. Spread with pizza sauce; sprinkle with half the mozzarella. Top with pepperoni and remaining mozzarella. Cover with tops of buns. Mix butter, Italian seasoning and garlic powder until blended; drizzle over sandwiches. Sprinkle with Parmesan; cover. Bake 25 min. or until heated through, uncovering for the last 5 min. These easy-to-make sandwiches can be assembled ahead of time. Refrigerate up to 24 hours before baking as directed.